Homeowners are ‘earning’ more from their properties than from turning up for work, new research suggests. 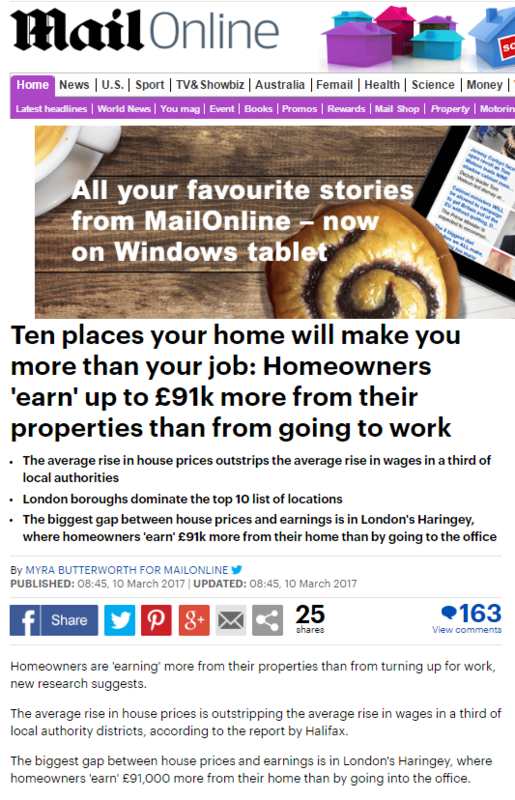 This is obviously great news, if you 1) live in one of those places, 2) are looking to sell your house, and 3) aren’t looking to then have to buy a place to live – because prices are apparently rising faster than wages, haven’t you heard? Of course, this story is little more than a reminder that getting your foot on the property ladder is important, and for that you’ll need a bank or building society… like, perhaps, Halifax? Martin Ellis, housing economist at Halifax, said: ‘Buoyancy in the housing market over the past two to five years has resulted in homes increasing in value by more than total take-home earnings for the average homeowner in many areas, though mostly in southern England. ‘While it’s no longer unusual for houses to ‘earn’ more than the people living in them in some places, there are clearly local impacts. This entry was posted in Halifax on March 23, 2017 by Michael Marshall.